Cary Elwes Interview: "As You Wish": An Insider's Look at the Making of "The Princess Bride"
British actor Cary Elwes revisits his most famous role in one of Hollywood’s most popular and successful films to cross generations, The Princess Bride, and brings this classic fairy tale to life again for the first time in his memoir As You Wish: Inconceivable Tales from the Making of The Princess Bride, to be released October 14, 2014. Elwes tantalizes fans with never-before-told, behind-the-scenes stories, tidbits and memories of the making of the film, and the book also includes recollections from Rob Reiner, Norman Lear, writer William Goldman and stars Robin Wright, Billy Crystal and Christopher Guest. In addition to Westley in The Princess Bride, Elwes is also known for his roles as Arthur Holmwood in Bram Stoker’s Dracula, Robin Hood in Robin Hood: Men in Tights, Garrett in Quest for Camelot and Dr. Lawrence Gordon in Saw and Saw 3D: The Final Chapter. Other film appearances include Oxford Blues, Lady Jane, Glory, Days of Thunder, The Chase, New Year’s Eve, Twister, Kiss the Girls, Cradle Will Rock, Georgia Rule, A Christmas Carol, The Citizen and Reach Me. Elwes’ television appearances are Seinfeld, The Pentagon Wars (HBO TV film), The Outer Limits, Night Visions, Uprising (TV film), The X-Files, Pope John Paul II (TV mini-series), Psych, Leverage, Perception, The Anna Nicole Story (TV film) and Granite Flats. Voiceover work includes Quest for Camelot, Pinky and the Brain and Batman Beyond. Melissa Parker (Smashing Interviews Magazine): Cary, what was the purpose for writing As You Wish? Cary Elwes: Well, none of the other actors on the film decided to write anything, and I get asked all the time by fans about what my experience was like working on the film. It’s a little over twenty-five years later, and I figured that I didn’t want to wait another ten or fifteen years when my memory starts to completely fade, so I thought I’d do it now. The response has been overwhelming, so I feel very fortunate in that. I seem to have made a pretty good decision to do it right now. Melissa Parker (Smashing Interviews Magazine): It’s a very interesting, fun book. Cary Elwes: Thank you, Melissa. I appreciate that. Melissa Parker (Smashing Interviews Magazine): To what do you attribute the long-lasting success of the film? Nobody really quite knows what it is that you can put your finger on. The Princess Bride really didn’t have an audience when it came out. Nobody went to see it. It gained popularity in the VHS marketplace. Melissa Parker (Smashing Interviews Magazine): Was it the Bill Cosby imitation or your resemblance to Douglas Fairbanks that won you the part of Westley? Cary Elwes: That you’ll have to ask Rob Reiner. I suspect it was probably a combination of the two. Melissa Parker (Smashing Interviews Magazine): Can you pick a favorite scene? Cary Elwes: I don’t have one favorite scene. The whole process of making the film was so much fun that I can’t sort of pinpoint one moment or any moment in time. I loved every moment of it, so I can’t really speak to one scene over another. That wouldn’t be fair, you know? Cary Elwes: Oh, thank you. Cary Elwes: There are no swords in the house, so I didn’t really have any reason to get back into it (laughs). But Mandy and I trained very hard for that, and we became quite proficient at fencing. I feel like we had the best trainers working with us in Bob Anderson and Peter Diamond. We were very fortunate. Melissa Parker (Smashing Interviews Magazine): I thought it was great that no stunt guys were used for that fight. Cary Elwes: Usually it is the stunt guys, you know, when you look at those pirate movies from the 40s or the 30s or what have you. Usually if you look at the sequences, even Errol Flynn and Burt Lancaster and Dougie Fairbanks, in the wide shots … it’s all stunt doubles. Rob (Reiner) was adamant that it be us fighting in the movie. He said, “I want Mandy and Cary to be onscreen. I want it to be just them.” That’s what we did. Melissa Parker (Smashing Interviews Magazine): I believe that you were injured a couple of times during filming but not in the fencing scenes. Cary Elwes: That is correct, but I don’t want to give too much away. I want people to go out and buy the book and find out. It’s fun. They’ll find out just how clumsy I really am. Melissa Parker (Smashing Interviews Magazine): Robin Wright has said that she thought she was in love with you while filming the movie and asked for additional kissing scenes. Were you aware of that? Cary Elwes: No. We were just incredibly close friends, and we bonded as such on the film. Everybody … it’s hard not to fall in love with Robin. I think I can speak for anyone who has gotten to know her. She’s an extraordinary lady, so yeah, we all fell in love with her. It was one big happy family. 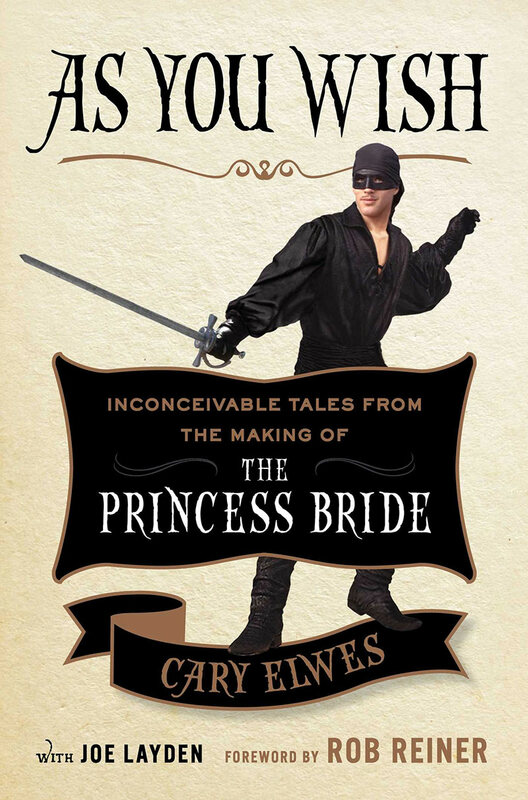 Melissa Parker (Smashing Interviews Magazine): Rob has said that The Princess Bride would never have gotten made today. What was so different about the films made in the 80s? Cary Elwes: Today The Princess Bride would probably have a lot of CGI (Computer Generated Imagery), and I think half the charm of the film is that it was made with little people in rat suits with puppetry and all that, so all of the effects were in-house rather than generated by a computer. Audiences today sort of switch off a little bit when they know the CGI is coming because they already know it’s not real even though it’s fun to watch. When you look at The Princess Bride, it’s a lot more visceral because there are no … we didn’t have the budget for that anyway. Even if we had the money, I don’t think technology had caught up to us at that point where we could do anything that would be halfway decent. Melissa Parker (Smashing Interviews Magazine): In the book, you talk about your insecurities and neuroses as a young actor. How has that changed over twenty-five years later? Cary Elwes: Well, I was twenty-three when I made The Princess Bride, so I was definitely something of an unknown actor at the time. All the other actors on the film had a much longer resume than I did, so I was probably fairly insecure going in knowing that I was the new guy on the block so to speak. Obviously today I’ve done over eighty movies now, so I’m a lot more comfortable in my own skin and confident in my own talent. I don’t really sweat the small stuff anymore. Melissa Parker (Smashing Interviews Magazine): After all of these years, is Westley still the fan favorite over all of your other roles? Cary Elwes: No question. No question. I still get fan mail from all over the world, and it’s wonderful. I’m very glad. The Princess Bride is the gift that keeps on giving. It’s a film that spans generations, so it’s one of those unique phenomena. Melissa Parker (Smashing Interviews Magazine): Is your daughter old enough to watch The Princess Bride? Cary Elwes: She’s a little too young at this point, but very soon we shall be having a screening. I’m looking forward to that. Melissa Parker (Smashing Interviews Magazine): Do you personally prefer to act in comedies or dramas? Cary Elwes: I don’t really choose a project based on its genre. I try to pick a project based on if it appeals to me, if the script appeals to me. That’s really my criteria. If it works as a comedy, drama, thriller of whatever, then that’s a good sign, but I don’t really pick genres. Melissa Parker (Smashing Interviews Magazine): Was it at an early age that you realized you wanted to become an actor? Cary Elwes: Yes. I was a little kid really. I used to watch a lot of television, and I grew up in England where we had two channels. I watched a lot of Peter Sellers and early Monty Python, which was a show called Do Not Adjust Your Set. These were early comedies that really appealed to me, so I really was attracted to comedy as a kid just because I liked to laugh. I guess everybody does, you know? Then as my tastes got more refined as I grew older, I got more into different filmmakers and different genres. Melissa Parker (Smashing Interviews Magazine): What are your upcoming projects, Cary? Cary Elwes: I have two films coming up. I have Sugar Mountain with Jason Momoa and Melora Walters. That’s probably out in the fall, and it’s a family drama set in Alaska. The other one is another drama called The Greens Are Gone with Catherine Keener shot in Boston, and it’s probably coming out around the same time. Melissa Parker (Smashing Interviews Magazine): Tell me about your involvement with Mercy Corps. Cary Elwes: I got involved with them about eight years ago. Unlike all the non-governmental agencies that go into hot spots around the world that are dealing with either manmade or natural disasters, they stick around. After all the food, medicines and shelters have been provided, they stay and help the community that’s been ravaged by whatever disaster that has befallen them. They help that community get back on their feet by helping the locals start up small businesses through microloans and things like that. They’re really involved in getting the community back on their feet. I found that to be so interesting. Not to slight the other NGOs in any way, but most of them pack up and leave after a certain period of time to leave the citizens to fend for themselves whereas Mercy Corps believes if you give a person a fish, you feed them for a day, but if you give the person a fishing rod, you feed them for a lifetime. That’s their whole philosophy, and that’s why I’m so supportive of them. I believe they have the right idea about helping communities that have been ravaged by earthquakes, typhoons, hurricanes and floods, to rebuild communities and help them get back on their feet. Melissa Parker (Smashing Interviews Magazine): How do you spend your time on those rare days off? Cary Elwes: My main preoccupation is spending time with my family and my daughter. She’s the best thing that’s ever happened to me in my life, so I get to play with her. I get to act out all the characters for her with puppets and toys and dolls, so that’s kind of fun. I’ve become a master at Barbie. Cary Elwes: There you go! There you go! You’ve got your thinking cap on, Melissa.